To make a reservation, you can contact us via email (see email button on Home Page or to the right side of this page). We still enjoy the “old-fashioned” method of a phone call, which will get you a real person (almost always one of the owners with decades of hospitality experience who can help you! Call at 207-549-5961 or Rick’s Cell at 207-312-1281. An answering machine is available to leave a message for returning your call. Please, no sales calls or solicitations to any of the above phone numbers. 1) Full amount due upon making reservation, during peak season cash, check, credit cards are accepted, outside that time cash or credit are welcome. 2) Cancellation: 3 weeks notice is required. If Cancellation is within 3 weeks full amount will be charged. No charges are incurred if we are able to re-rent the whole space you reserved. 3) Check-in time is 2 pm. Check-out time is 11 am. Other times can be accommodated upon request. 4) Check-in after 9:00 PM is by appointment, call 207-549-5961 for late check in. 5) No smoking, please. 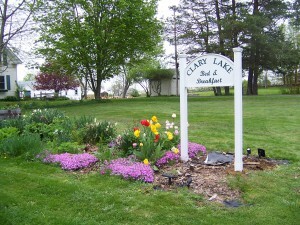 Clary Lake Bed and Breakfast is a Smoke Free Environment. 6) Pets are allowed if guest will monitor any noise and pick up after pet when outdoors. All pets must be on leash and a person holding the leash while not in the guest room.